Danny Fox is hammering on the door for a recall to the Wigan Athletic starting XI for Saturday’s visit of Brentford. The 32-year-old centre-back – a January capturel from Nottingham Forest – has been sidelined since damaging a knee at Derby on March 5. 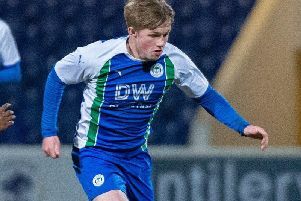 In fact, Fox has completed the 90 minutes just twice in five appearances for Latics. But he’s used to international break to get back to full fitness, and boss Paul Cook now has a selection headache. Cook recalled Cedric Kipre alongside Chey Dunkley for the 5-2 victory over at Bolton in Wigan’s last outing, with Jonas Olsson also in the frame. And Dunkley admits everyone is keeping their fingers crossed to get the nod. “I’ve said before, but it’s a squad game these days – and everyone’s got a part to play,” he told the Wigan Post. “I’ve had my own time out of the side this year, and you’ve got to fight your way back in. “It was nice to have big Ced back alongside me against Bolton, and he’s given the manager something to think about. “It’s healthy competition, but the players are all together as one. “We know somebody has to miss out, sometimes it might be you, but the team is the most important thing. “We fought so hard to get here last year, and we won’t give that up without a fight. Forward Anthony Pilkington – another January arrival – is also fit to return after a knee problem. But he’ll be looking at a bench berth at best, with the Holy Trinity of Nick Powell, Michael Jacobs and Gavin Massey back to their best after lengthy lay-offs.